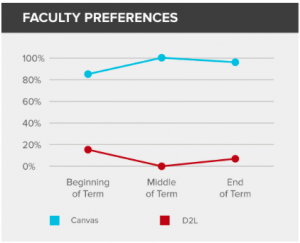 Do you want to know what other faculty think about Canvas? The simple and intuitive interface of Canvas is embraced by many users, including both instructors and students. But what, specifically, do other users like about Canvas? To answer this question, we have found a few testimonials from faculty. These will help you learn more about what Canvas can offer you. Also, students at other institutions can tell you why this will be a good move. Faculty from the University of Colorado-Denver, Rider University, and San Jose State University shared their experiences using Canvas for the first semester. They recognized the easiness of Canvas and had a vision of how this new LMS can help them and their students in their teaching and learning, respectively. (Video 2’08”). Colorado State University interviewed their faculty about their perspective on using Canvas and how faculty think that Canvas can help their students learn. Why Faculty Like Canvas (1’39”): In this video, you will learn why the faculty at Colorado State University embrace this new LMS and how Canvas makes their life easier. Faculty Talk About Why Their Students Like Canvas (50”): As an educator, you might wonder how students at other institutions think about this new LMS and whether it also helps students. In this video, the faculty at Colorado State University share their understanding about how students enjoy using this new LMS. 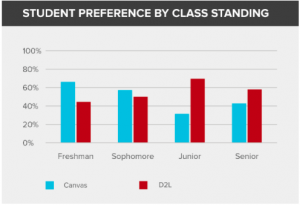 Ohio State University switched from Desire2Learn to Canvas as well. They conducted a study during the pilot semester, and the following two charts show us how their faculty and students feel about the migration. We can tell that faculty at Ohio State University really embrace Canvas as their new LMS. The student data is interesting, showing a lower acceptance rate from juniors and seniors. It’s understandable that changes can be uncomfortable and people might resist them. You or your students might feel the same as the juniors or seniors at Ohio State University who are not comfortable with the changes; however, we believe that if you can join some webinars or take some training that we offer, the learning curve will be less steep for you. The following graph provides another kind of testimonial from University of California at Santa Cruz. They migrated to Canvas from eCommons, which is similar to Desire2Learn. How do the faculty feel about Canvas after the migration? 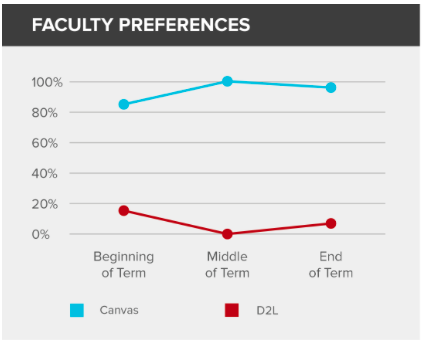 In this chart, you can tell that faculty at UC-Santa Cruz really enjoy using Canvas. There is one thing that they were dissatisfied with, and that was quiz functionality. We have learned that the dissatisfaction came from faculty having to redesign quiz questions and answers to accommodate some instances where Canvas did not support the same features as their previous LMS. We plan to address these concerns preemptively in our webinars and training courses. Additionally, your instructional designer will walk through Canvas with you to help you make appropriate changes as needed. So, please take a deep breath and let us guide you along this journey. In addition to statistical reports, other institutions conducted interviews or surveys with open-ended questions to gather more information about individual experiences with and opinions about Canvas. The following are a few comments we found among the testimonials from other universities.